Delling is a compact floorstanding 2.5-way loudspeaker using state of the art Seas Excel drivers. The woofers are two E0049-08S W16NX001 . These speakers are really good at producing deep bass in small enclosures. The chassis and surround has been designed to maximize the available radiating area. The chassis has the same outer diameter as our 15cm chassis, but significantly larger radiating area, and also more depth to allow for long excursion. The tweeter is the widely used E0011-06 T25CF002 "Millennium" Appreciated by builders of our kit's for years, and and also selected by Siegfried Linkwitz for use in his Orion dipole speaker, this tweeter is well known for it's accurate and effortless reproduction of the high-frequency range. 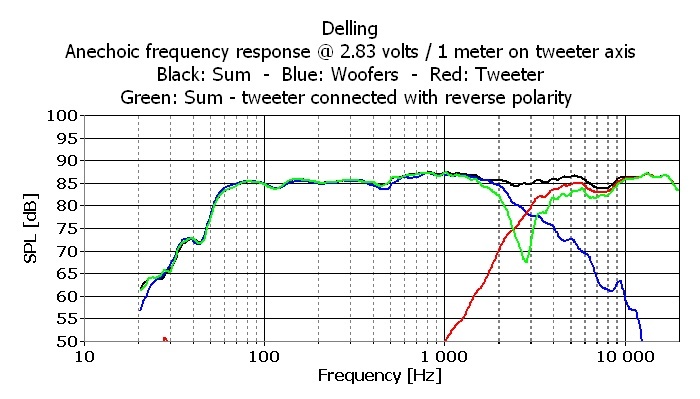 The woofers T/S parameters indicate that these drivers may be used in very small boxes. In this case we have oversized the volume a bit to extend the frequency range even further into the bass region. The front baffle is narrow, and the height of the cabinet is sufficient to bring the tweeter on axis in a normal listening chair. Net cabinet volume is 24 litres. The cabinet is braced with horizontal MDF shelves that has holes to allow for free air-flow. The braces are placed with different distance to each other. 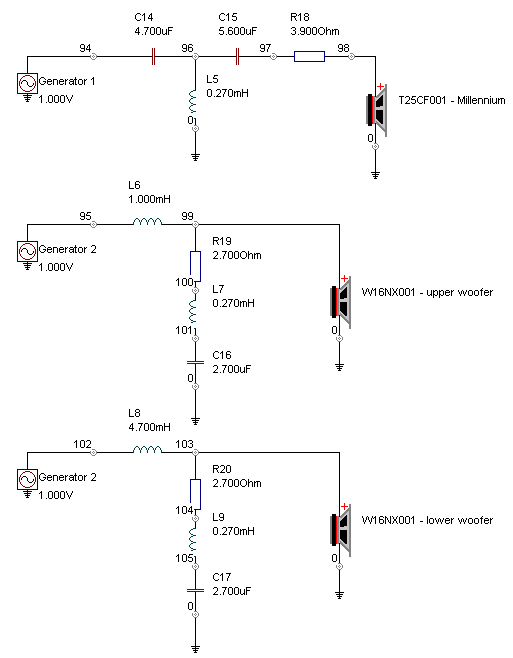 This will distribute the panel resonances over a broader frequency range. To further reduce panel resonances you may add bitumen based damping sheets on the inside of the cabinet walls. We have used 140g of Rockwool for damping of the cabinet, with 1/3 of this amount behind each of the woofers, and the last 1/3 in the space between the two lower braces. The simulated halfspace response in a 24 liter cabinet with a Helmholz frequency at 40 hz predicts a -3dB point at 43 Hz. The crossover is a 2.5-way topology. The lower woofer fills in the frequency range below the baffle step. Both woofers are filtered with a single series inductor and a notch filter. The tweeter is filtered with a 3rd order network. This results in a summed response that is flat on the listening axis. All drivers should be connected with the same polarity. The crossover frequency is 2.8 kHz. Minimum impedance is 4.2 ohm at 175 Hz. 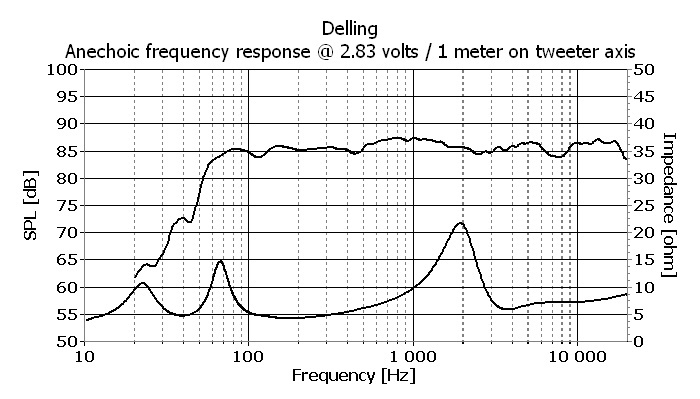 The measured axial frequency response variation is +/- 1.5dB between 65 Hz and 20 kHz.